Facebook, where you can follow my work. 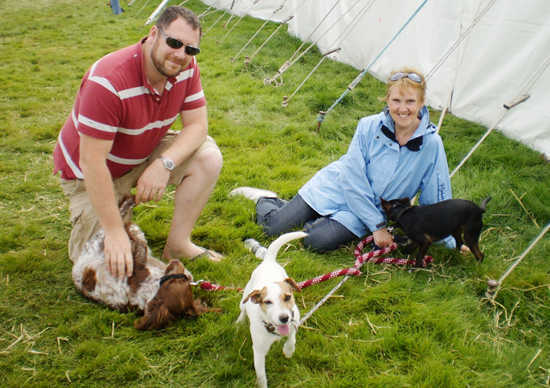 I live near Goodwood, down on the south coast with my partner and our 3 very lively dogs! I was born over in Toronto Canada but moved over to England when I was 4 and spent much of my youth in the west country where the majority of my family live. Which came first: the love of animals or the passion for art? I have always been an animal lover and I guess that somewhat fueled my passion for painting. I’ve got stacks of dusty old portfolios up in the loft filled with old sketches and school books filled with doodles or horses! I was always being criticised in my school reports for having ‘tunnel vision’. 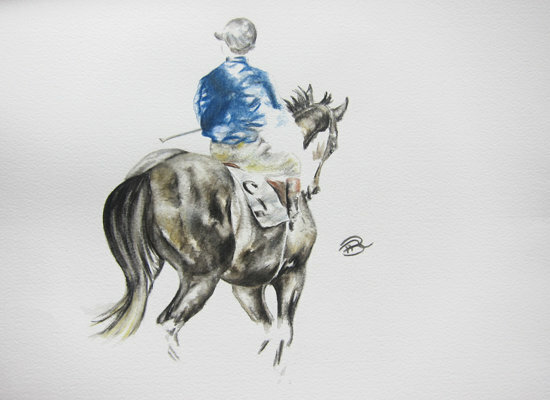 You don’t just paint & draw horses, what is your favorite subject of all time? Well I’m definitely a country girl through and through, I love the outdoors and can probably confess that I’m more familiar with the South Downs than I am with our local town centre! I also love to travel and try to take mini adventure holidays every year, just for 2-3 weeks. We’ve just returned from a wonderful holiday travelling around Cuba, it was definitely one of my favorite destinations so far. Who are your main artistic influences? I have to say my main influence is my Mum, she’s an amazing artist and as a child I can always remember being completely fascinated with how she could try her hand at absolutely anything from landscapes to portraits of people and she would always completely capture them. I made it my mission and personal challenge to learn as much as I possibly could from her, and for me it was the best tutoring I could have wished for! 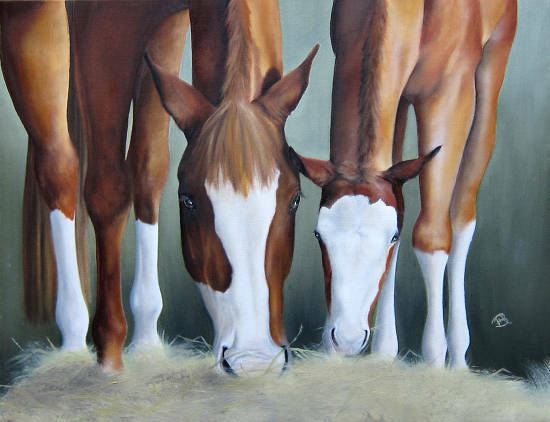 Unfortunately I never quite grasped her expertise on painting people and landscapes but my absolute passion is animals, and of course horses in particular. 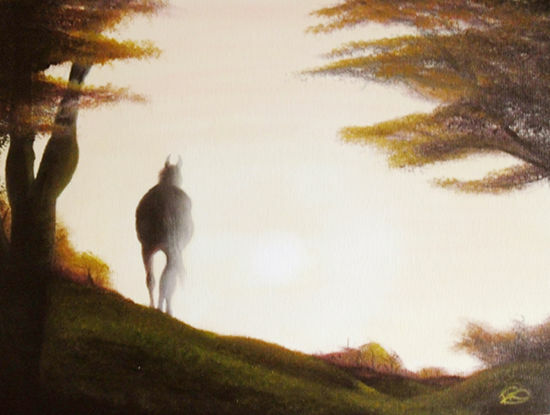 I grew up obsessed with horses and was lucky enough to have my own from my early teens, they were always constant muses for me and I was forever snapping away on my camera and avidly waiting for the photographs to be developed so I could paint from them. My long standing favorite horse was a big 17h chestnut Irish gelding named Tango was bought for a few hundred pounds when I was 15. 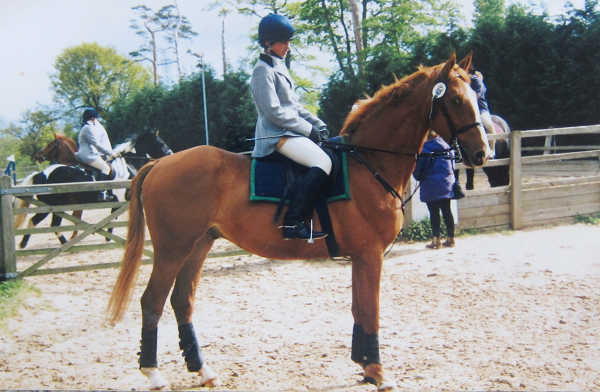 He was a wonderful horse and really grew my confidence, we were always competing and although I was never quite gutsy enough to travel up the grades eventing him, we did lots of affilliated showjumping and the buzz of competition has always remained with me as a constant source of inspiration for my work. Well I’m very informal with my painting, I’m yet to have a nice workable studio of my own so for now I always end up (despite my best efforts) plonked on the sofa with the dogs and my table easel on my lap. A very antisocial habit as I tend to take up the entire living room! I wouldn’t say a place in particular but whenever I visit a big event like Badminton or Hickstead I always return home brimming with inspiration and itching to paint. What effect do you think the Internet will have on art & artists? Well as a social network and a source of inspiration etc I think it’s unbeatable but unfortunately it will never match the feeling visiting a gallery in person gives you. I think its almost impossible to showcase art on the Internet, or for that matter anywhere, and achieve the same visual experience a gallery can give you. For the better, yes it absolutely has. I have found The Society of Equestrian Artists through the Internet and it has given me endless inspiration and goals to achieve. It has also been wonderful meeting other artists who share the same passions. I think my favorite piece is probably the first good oil painting I did (age 15) that made me realise I could have a future in art. 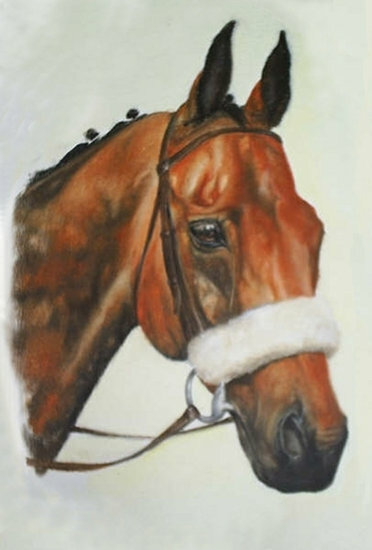 It’s a simple portrait of a bay Thoroughbred with a big sheepskin noseband and it single handedly sparked my belief in taking on commissions and beginning to progress myself as a portrait artist. It’s actually painted on a cheap old board, probably from a toy shop or similar! But maybe thats a good thing because for that reason I could never sell it, and I love having it still to this day, 16 years later. I’m sure I’ll have it forever. 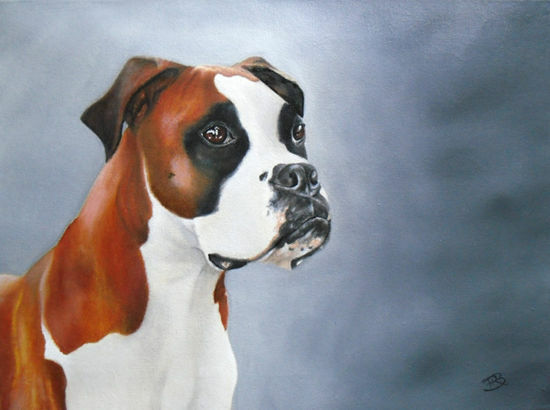 Animal welfare is a huge deal to me, I have always supported charities anyhow I could and its been a great venture with Captured on Canvas as I have been able to donate a percentage of my commissions to both Redwings Horse Sanctuary and Dogs Trust. 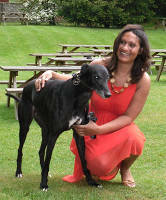 I have also run competitions to raise funds and awareness for the Kent Greyhound Trust. I absolutely LOVE greyhounds! Yes, I have stared a whole new venture working in minimalist style using watercolour. Its been hugely enjoyable as it’s a much tidier and easier medium to work in then oil and really suits my lack of studio space at the moment. I’m hoping to produce a number of original ‘one off’ pieces as well as some limited edition prints and a couple of extra large pieces. Its a hugely exciting new venture for me and you’ll most likely see me exhibiting at a number of country shows and equestrian events in the near future. Do pop over and say hello! Thanks to Robin for answering the interview and sharing her work. Be sure to check out her art site periodically for updates about her latest works. 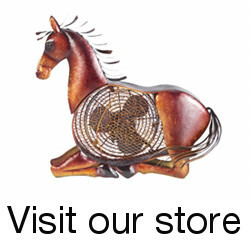 Also stay tuned for more interviews with horse artists and photographers. 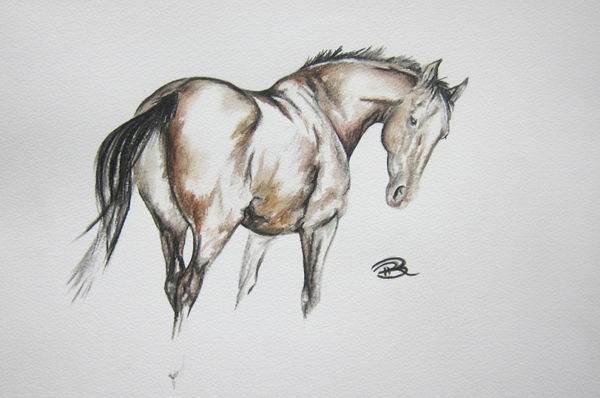 Are you a horse artist or do you know an equine artist you’d like to see featured? Add your name and website in the comments below or drop me a note to get involved. This entry was posted in Interviews on February 1, 2011 by The Equinest. Robin has recently painted a protrait of my very special horse, sadly no longer with me, he is now proudly hanging on my wall and I love it. Such a talented young artist whose work is stunning. I am now saving up for a portait of my dogs. Robin, I really like your new minimalist style. Also nice to hear that you help out animal rescues with your art. 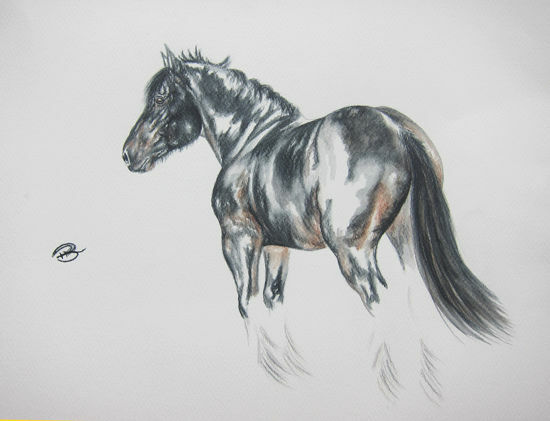 I love your minamalist work and would like you to paint my beloved Welsh Cob, Brockleton Craig. Can you e-mail me prices and what you need in terms of photos etc. Thanks.